Sense and action divide the internal states of the system from the hidden states external to it. This division is called a “Markov Blanket”. I’ve tried to show the equations between the variables correctly but I’m not too sure if I have them right. They seem to change from paper to paper. F is an expression of the free energy, but I’m not sure what f is at the moment, except for being some sort of “flow”. Sometimes I wonder if I overdo this fourfold thing. The law of the instrument says something like “if all you have is a hammer, everything looks like a nail”. Dividing things up into four parts, or bringing four things together into a whole, is the belabored theme of this blog. Fourfolds are my hammer, and what a nice hammer it is! When my father was in a nursing home, he had a roommate for a period of time that would just draw houses continuously. Not nice architectural renderings either, but houses like a child would, where you can see three sides of it at once (the front and both sides). 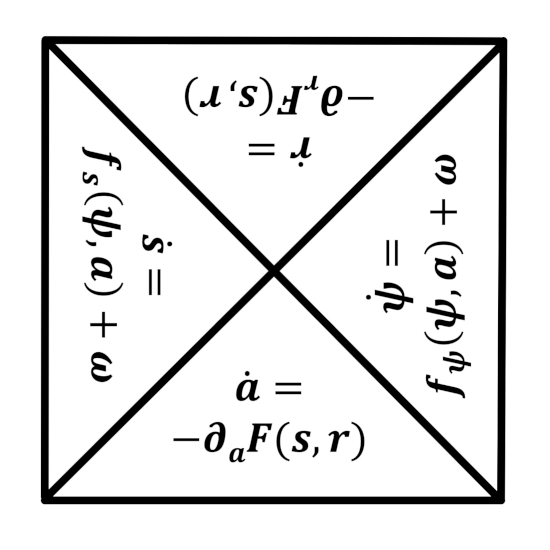 I might be doing that one day, endlessly drawing fourfold diagrams in endless fourfold permutations. Speaking of hammers, Martin Heidegger also wrote at length about them in regards to equipment or instrumentality. 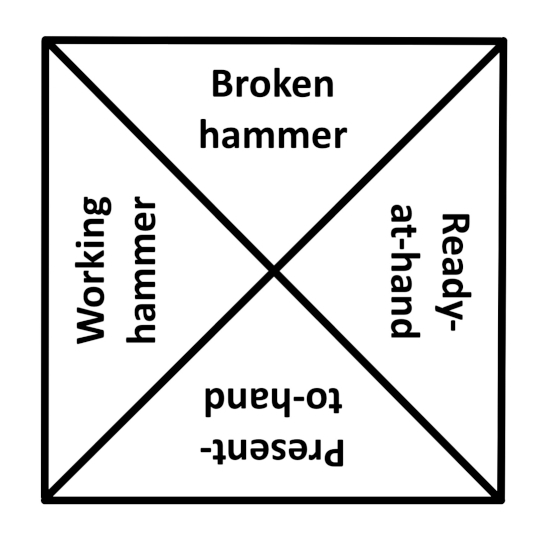 He contrasted a working hammer that was “ready-to-hand” to a broken hammer that was “present-at-hand”. The working hammer recedes into the background of its ready utility, but the broken hammer, being useless, is merely present in pieces. The notion of science as negative enterprise was raised by Heidegger since scientific investigation only gives you the present-at-hand, and not the smooth extension of ability that is ready-to-hand. I disagree, because how can you fashion a hammer in the first place or repair it if you aren’t full cognizant of its constituents and construction? I realize that some worthwhile analyses are made by this approach to technology. For example, few are able to construct or repair modern automobiles or smartphones. In a sense, that should make Heidegger happy, since most are using this modern equipment with no clue as to how they work. And if they wear out or break or become obsolete, they are too costly to repair or upgrade and are sent to the scrapheap. But I say this tongue-in-cheek. Heidegger’s “tool analysis” is the basis for much of his later writings, specifically concerning “das Geviert” (simply meaning square). If tool analysis is itself a tool, what happens when you apply tool analysis towards itself? Does one get an infinite fractal of fourfolds, ascending and descending, approaching and receding? “The Question Concerning Technology” by Martin Heidegger is not an easy read. This short essay is full of unusual terms and phrases. I think part of the reason for this is Heidegger’s style of writing, and part is the capacity of the German language to build compound words easily. Thus in the English translation you have several hyphenated words like “standing-reserve” and “bringing-forth”. Of course, difficult terminology seems to be typical for Heidegger, but there are also many words taken from classical philosophy that have special meanings, which Heidegger was well versed in. In this essay we first learn that our question is really a questioning and will be a process that “builds a way” to understanding, so initially we are more interested in the journey than the destination. The way that is desired is towards a “free relationship” between an “open” human existence and the “essence of technology” (essence being what a thing is, as if we can know exactly, so finding out is part of our journey). Second, we are told that the essence of technology is not technological, so to try to find what this essence is by using more technology is to be in an “unfree” relationship with it. Third, our question concerning technology is really asking what technology is. A common and “correct” definition is that it is both a means to an end, and a human activity. The former is the instrumental aspect of technology, and the later is the anthropological aspect. But Heidegger does not think that these two aspects are the complete or “true” ones, and so our questioning leads us to inquire as to the essence of instrumentality. For that, we turn next to consider the general causes of things and their effects, and so on to examine the classical Four Causes of Aristotle. 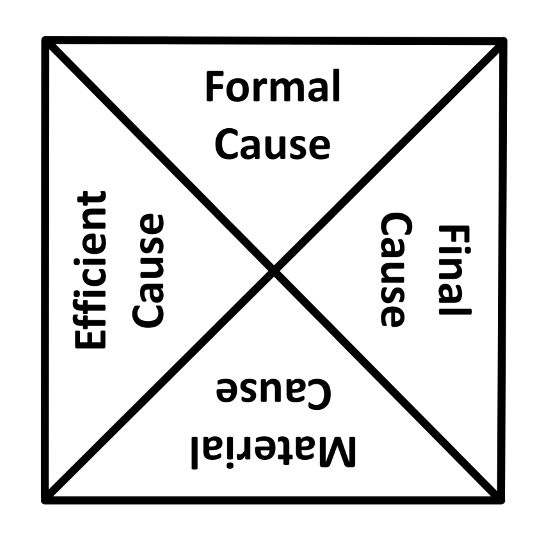 By thinking about causes in this way, can we discover the essence of causality? Heidegger explains that what causality is involves the things responsible for the bringing about of other things or what kinds of things a thing is indebted to in order for it to occur. (Others have argued that instead of causes another good name is the four “becauses”, i.e. the reasons for or the explanations of things). Note that Heidegger uses the terms responsibility and indebtedness to give the Four Causes (what I consider to be) a normative aspect. Heidegger presents to us a silver chalice as an example of how to think about the the Four Causes in relation to Greek thought. 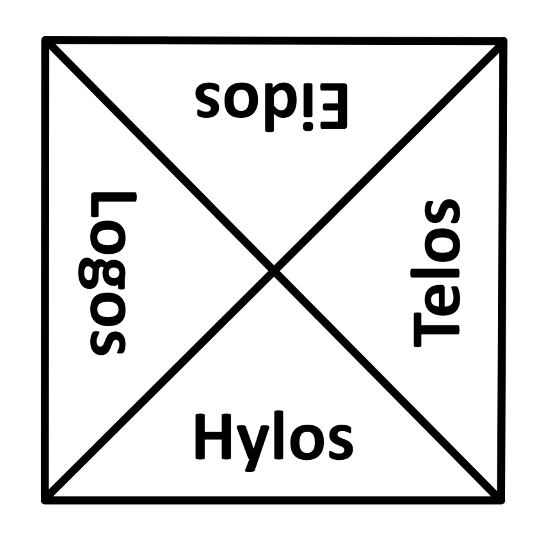 Hylos (or hyle) is the material we start with, Eidos is its form or aspect, Telos is responsible for bringing together both (but not as aim or purpose but as bounds or context), and all three are indebted to… Logos? Heidegger now departs from how Aristotle was understood to view the causes named after him, and says so himself, in order to argue that these four ways of responsibility and indebtedness are really what these causes are all about.